Coming out of the financial crisis in 2008–2009, corporations took aggressive steps to shore up their balance sheets and rein in expenses, and today they are running very lean, profitable organizations, with the added benefit of having record levels of cash on hand. It has been a very attractive combination for investors, especially given the record-low yields in the Treasury markets. 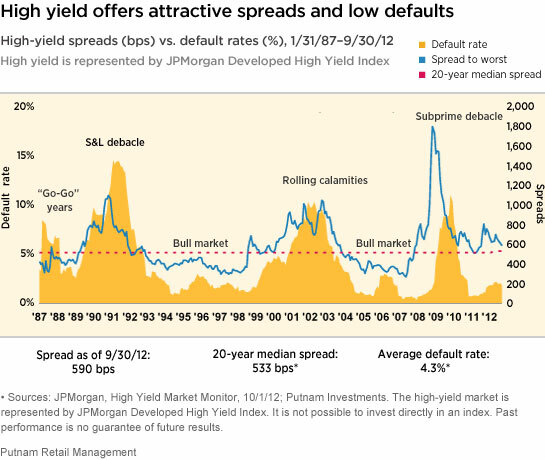 Historically, after a period of heightened defaults in the high-yield market, the default rate among the remaining companies in the high-yield universe has tended to remain relatively low for about five to ten years. Today, we are only three years out from the most recent peak in defaults in 2009, so we have reason to believe this trend of low defaults could continue for some time, although there is no guarantee this market cycle will be like past cycles. Moreover, we are not seeing significant levels of issuance for mergers and acquisitions or for leveraged buyout activity. Today, as much as two thirds of new high-yield issuance is being used to refinance existing bank debt. And as a result of that trend, about 25% of the high-yield market is now secured, as that bank debt collateral has been trans­ferred to the new bonds. In addition, many high-yield issuers have been very conser­vative with their use of capital because economic growth has been so slow, adding to their cash reserves, for example, instead of investing in new infrastructure or seeking to expand their businesses through acquisitions. This behavior has been good for bond investors, who have benefited from improving corporate balance sheets and stable revenues. Our base case calls for a continued slow growth recovery in the United States, which would be conducive to solid performance in the corporate debt markets. While spreads ended the quarter tighter and are closer to their long-term averages, they remain attractive relative to defaults, which have been low and stable. All in all, we believe high-yield and corporate debt broadly remain attractive options for investors in a low-rate world. Lower-rated bonds may offer higher yields in return for more risk. Credit risk is generally greater for below investment-grade bonds.